Dive into the wreck of the Whydah to discover the true stories of Real Pirates through more than 200 fascinating artifacts in the world’s first exhibition of authentic pirate treasure! Touch real pirate gold and marvel at gold and silver coins from all over the world, cannons, swords, and pistols along with the ship’s massive bell, and discover the advanced technology that revealed these treasures to the modern world. The slave ship Whydah began her short life in London, England, in 1715. Less than two years later, now a pirate ship, she sank to the ocean floor off Cape Cod. Using artifacts recovered from the wreck – the first and only authenticated pirate shipwreck – Real Pirates reveals the true story behind this vessel—a story more compelling than anything dreamt up by Hollywood. Meet the crew of a real pirate ship that started as a slave ship—and gain insights into the violence and idealism of early 18th century piracy. Slave ships were perfect prizes for pirates: easy to maneuver, unusually fast, and armed to the hilt. After the Whydah‘s human cargo was unloaded in the West Indies, the ship was captured by notorious pirate Sam Bellamy and his motley crew. These pirates created an outlaw life within the brutal realities of the European and Caribbean world. Hailing from many nations, they included ordinary seamen, free black men, political dissidents, escaped slaves, indentured servants, Africans freed from slave ships taken at sea, Native Americans, and runaway plantation workers. Guests see more than 200 actual Whydah artifacts, such as treasure from more than 54 ships, gold and silver coins from all over the world, Akan gold jewelry, cannons, swords, pistols, personal belongings, leg iron moldings from shackles, and the ship’s massive bell! Learn about the exciting world of nautical archaeology and the many technologies that have been developed to allow scientists and historians to unlock the clues embedded in these 300 year old “treasures.” Discover how high-powered digital x–rays of mysterious underwater concretions can reveal the artifacts hidden within. Real Pirates is a touring exhibition organized by National Geographic and Arts and Exhibitions International. 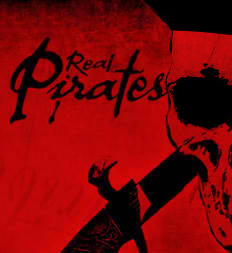 Real Pirates is locally underwritten by HMW Entertainment & Weatherford International Ltd.